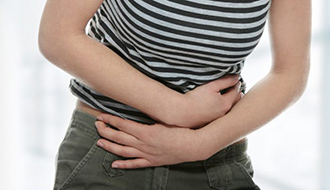 Abdominal pain has a large number of causes and should be investigated. It can be acute or chronic and can be caused by stomach, appendix, gallbladder, spleen, bowel, liver or gynaecological issues. Occasionally, abdominal pain can be felt in the abdomen but is referred from organs close to the abdomen such as the lower lungs, kidneys or gynaecological structures. It is therefore important to see a doctor for an examination and further investigation to understand the cause. How do I know if I have appendicitis? The pain from appendicitis is usually prolonged, and intensifies as it continues. It usually starts as an aching sensation around the belly button, and is then felt in the right lower abdomen. What is the difference between stomach pain and abdominal pain? If you are feeling pain around the navel or below, the pain is abdominal, and likely related to the intestines, uterus or ovaries. Pain right under the ribcage, on the right side, is more likely related to the liver or gallbladder. Pain above the navel is usually related to the stomach. Some stomach pain or discomfort is caused by temporary factors, such as constipation, trapped wind, or indigestion. If you notice that the pain is quickly becoming worse, if it doesn’t go away, if you notice rectal bleeding, or are also experiencing unusual vaginal discharge or sudden weight loss, it is recommended that you see a doctor as soon as possible.